The mission of our Club is to foster interaction among Alfa Romeo automobiles owners and to help sharing the enjoyment of owning and driving our beloved Alfas. 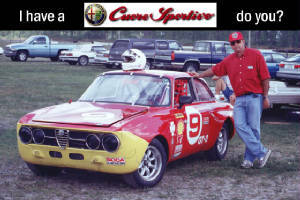 Welcome to our web-site, we hope you enjoy it, become our friend and an Alfa lover, and actively participate in our activities. Anybody owning an Alfa Romeo or anyway interested in Alfas is welcome to join our club. Click on the picture above and you will be directed to the national club website where you can jpin on line. There are several benefits to becoming a member of our club. Our members are close friends and we have a great time when we get together for social events or automotive activities such as going to watch car races, participating in autocross and driving schools, car shows, etc.